… said the actress to the Bishop. Seriously though, the last few weeks have been less than productive. After my recent major headache, and tiring stuff happening at work, I was looking forward to having a whole week of time for myself. Of course, that didn't happen. I contracted a flu like virus and had to take to my bed for a week, getting up only so I could build myself back up ready for work again and another 200 mile dash to visit my parents in Hampshire. Isn't that always the way? I had high hopes of getting some seeds sown and gardening done but it wasn't to be. I wasn't even up to reading or planning, let alone blogging or commenting. (Sorry for dropping off the radar, I'll be back to catching up this weekend, I hope!) I felt the need to eat well having had a week of enforced detox so I've revelled in being able to pop down to the garden and slice off a few purple sprouting broccoli stems or cavolo nero leaves to add to grains, beans or chick peas. We've had some gorgeously warm weather over the past few days so it was great to pop down to the garden this morning and see that spring has got underway. Light at the end of the tunnel, I hope. Anyone out there remember my late summer sowing experiment? 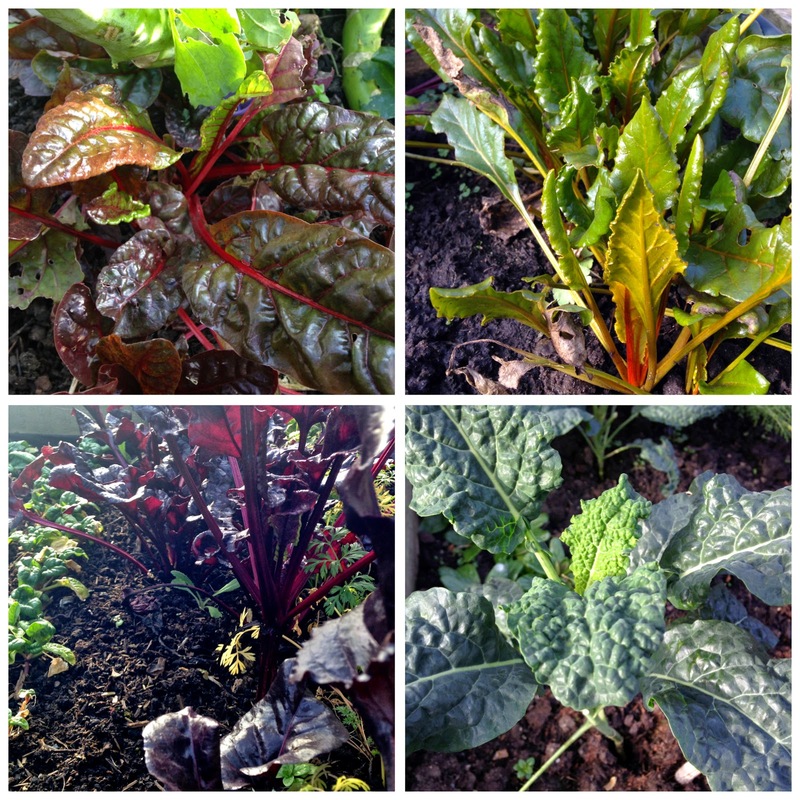 Although nothing much grew over winter, the beds were filled with plants from seed sown or plugs planted out in August last year - rows of rainbow chard, spinach, carrots, golden and red beetroot, russian kale (the pink frilly stuff) and small cavolo nero plants. Well, thanks to another relatively mild winter (at least here in London), all of these plants are ready to grow away strongly. 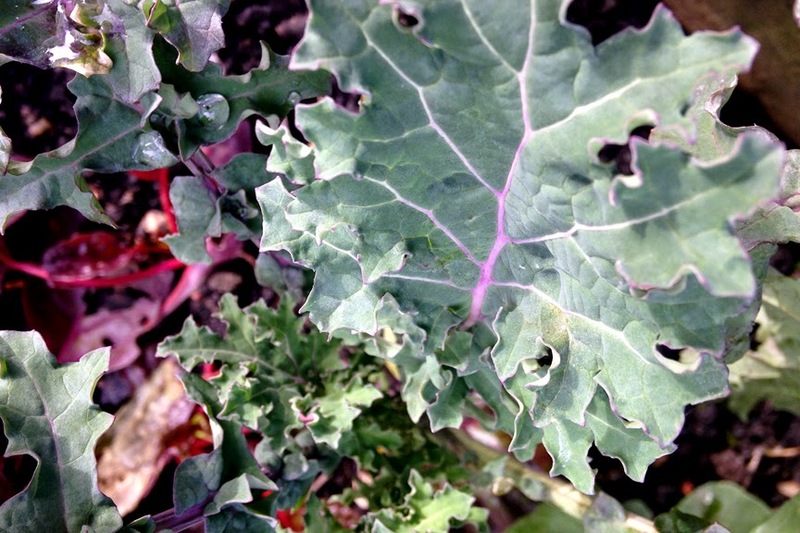 The leaf plants are still small but there are pickings of chard, kales and spinach. Yes, that really is as big as it looks. There was also a tiny romanesco cauliflower that I watched excitedly for weeks, waiting for it to get big enough to pick. That one has become huge over the past couple of weeks - a meal for 3 or 4 in itself! That cauliflower is bigger than my hand! 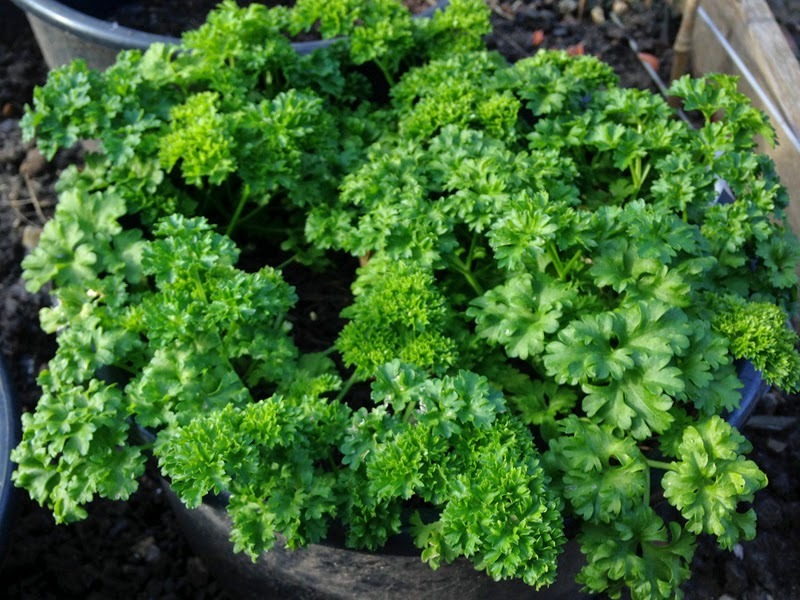 Parsley sown last summer is now growing strongly, as other perennial herbs (fennel, thyme, chives, mint and lemon balm) all start back into growth. So, although this is lovely having lots of veg to choose from, I haven't quite got it right - something to bear in mind when planning the timing of seed sowing this year. 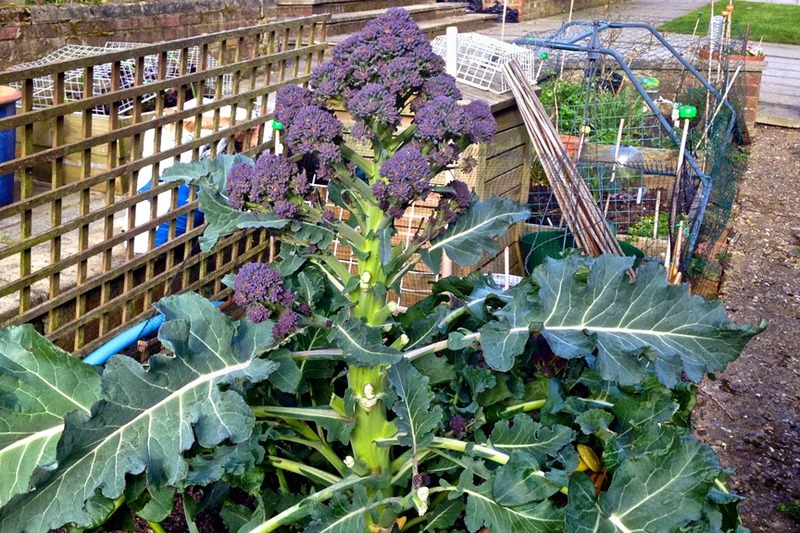 Not wishing to sound ungrateful, but I could do with having one broccoli plant ready while another is still growing. 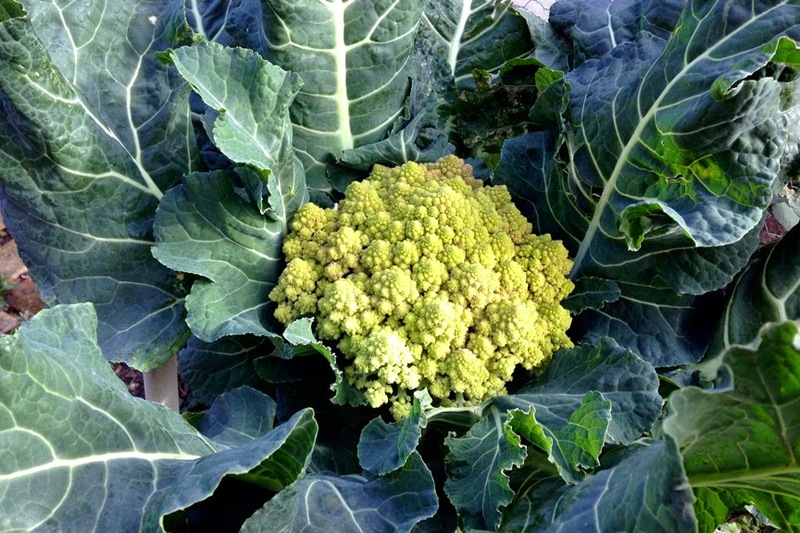 I've almost managed this as I have a green broccoli just starting to sprout but before then I have to eat my way through several huge heads of cauliflower and lots of PSB. 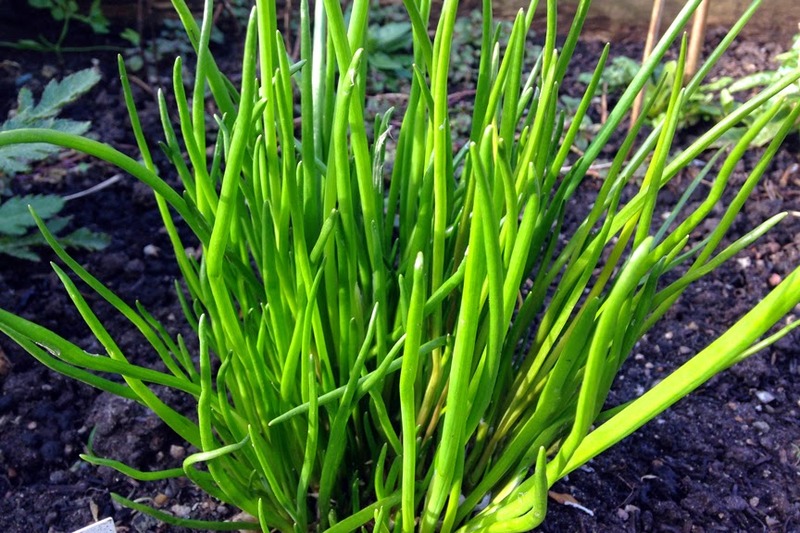 Next year, I want to have several mini caulis rather than one big one - I'm the only one that likes cauli in my home! Having said that, it's definitely time to sow a new round of brassicas as I don't think there's such a thing as having too much kale or broccoli in the garden and I quite fancy growing some of those fancy flower sprouts this year as well. So I'm off for a good look through my seed box with pen and paper to hand. Happy days!